Look out for ice patches, for hell has officially frozen over. 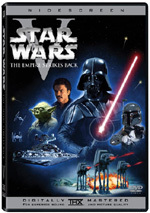 Doesn’t the DVD release of the Star Wars “Original Trilogy” portend one sign of the apocalypse? Maybe not, but given how long it took for these discs to arrive, one can understand a belief that George Lucas avoided their release to prevent Armageddon. In any case, we finally have the “Original Trilogy” in all their digital glory. These come in a splendid four-disc package entitled The Star Wars Trilogy. For full information on the individual movies, please consult my separate reviews of 1977’s Star Wars, 1980’s The Empire Strikes Back, and 1983’s Return of the Jedi via the links above. Please note that the picture and sound grades found at the top of this article represent an average for the three movies. Though this article covers the boxed set as a whole - which is the only possible way to purchase any of the movies – here I want to concentrate mainly on the package’s fourth DVD. 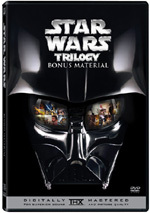 Called simply “Bonus Material”, this disc includes a wealth of Star Wars information. The elements split into four different areas. We start with “Documentary and Featurettes”, the domain that includes the most significant pieces. It opens with the disc’s major attraction, a two-hour, 30-minute and 36-second program entitled Empire of Dreams: The Story of the Star Wars Trilogy. This piece essentially splits into four areas to examine pre-Star Wars background and then each of the Trilogy’s films. The introduction/Star Wars segment lasts 86 minutes, while the Empire portion runs about 34 minutes. The final half an hour mainly looked at Jedi. Throughout the program, we get a mix of movie clips, archival materials, behind the scenes shots, and interviews. In the latter category, we hear from series creator/producer George Lucas, Empire director Irvin Kershner, visual effects supervisor Dennis Muren, sound designer Ben Burtt, journalists Walter Cronkite and Bill Moyers, filmmakers Steven Spielberg, producers Gary Kurtz and Howard Kazanjian, USC professor and cultural historian Leo Braudy, former 20th Century Fox production executive Gareth Wigan, former Fox studio chief Alan Ladd Jr., conceptual artist Ralph McQuarrie, miniature and optical effects cameraman Richard Edlund, model makers Paul Huston, Lorne Peterson and Steve Gawley, visual effects supervisor John Dykstra, stunt coordinator Peter Diamond, art director/production designer Norman Reynolds, stop-motion animator Phil Tippett, composer John Williams, editors Paul Hirsch and Richard Chew, production supervisor Robert Watts, visual effects art director Joe Johnston, visual effects artist Ken Ralston, former Lucasfilm marketing director Sid Ganis, writer Lawrence Kasdan, makeup and special creature designer Stuart Freeborn, former Lucasfilm president Charles Weber, production supervisor Jim Bloom and actors Harrison Ford, Carrie Fisher, Mark Hamill, Peter Mayhew, Kenny Baker, Anthony Daniels, James Earl Jones, Billy Dee Williams, Frank Oz, and Warwick Davis. ”Dreams” opens with some context, as it sets up the atmosphere of the Seventies both socially and at the movies. It then lets us know about Lucas’s life and path to the cinema as well as his work on THX-1138 and American Graffiti. It then moves into Lucas’s concepts for Star Wars, his influences, and its early development. We watch as Lucas looks for someone who’ll make the film and examine the growth of the story from concept to finished script. The program shows how Lucas used McQuarrie’s art to get the necessary funding and the unusual deal he worked out with Fox. From there Lucas assembles a team to work on the movie, and this includes the founding of Industrial Light and Magic to handle the effects. They discuss their early development and then we move to casting and its various concerns. At last we get into the production of Star Wars and its trials and tribulations. We see many elements from the shoot, its problems and conflicts, and hear many stories as well as additional information about continued studio pressures. From there we learn about editing, visual effects and sound elements, the score and early screenings of the flick. The program proceeds through the film’s first trailer, promotion, its release, enormous success, merchandising and awards. Once the dust settles, we move on to the creation of Empire. This opens with its unusual financial structure and its development. We learn why Lucas turned over the reins to Kershner and his approach to the material. The show progresses through visual effects and various challenges that came with the project. Location issues also arise along with topics connected to sets, new characters, and working with a puppet. We also get general notes from the shoot plus more specifics on the visuals and reshoots. We hear how the project went over-budget and secrecy that surrounded the story’s big revelation. The show follows the film’s release and success as well as how this allowed Lucas to build Skywalker Ranch and branch into other movies. Some union-related concerns connected to Empire arise, and we see why Lucas left the various guilds plus the reasons why Lucas’s pal Alan Ladd departed Fox. Eventually this leads to the creation of Jedi, as we head into that’s films pre-production. With Jedi, we watch concerns such as getting a director and ensuring the return of Harrison Ford. We get a discussion of the potential killing off of Solo and budgetary concerns. It covers building the Jabba puppet and the Rancor monster plus stunts and Leia’s famous metal bikini. We hear about director Richard Marquand’s inexperience with visual effects and how this led Lucas to spend lots of time on the set. Notes about the shooting of the speeder bike chase follow as well as the Ewoks and a melancholy feeling about the end of the production. From there, we learn about the change of the title from Revenge of the Jedi to Return of the Jedi and the flick’s opening. We get a quick mention of Lucas’s divorce before it follows with subsequent work done under his banner such as the revisions of the Star Wars films and the prequels. It ends with general reflections about the Lucas and Star Wars legacies. Only a subject as rich as Star Wars could present such a long documentary and still leave us with a desire for more - a lot more. “Dreams” offers a simply terrific look at the Original Trilogy. With a focus on three separate films, it necessarily remains somewhat superficial at times, but it offers sufficient exploration of most topics. It provides a nice overview of the progression and creation of the series. Much of the entertainment comes from the archival footage. For the best parts, we go to Star Wars and its heaps of shots from the set. Some mistakes appear as well as pre-effects images and alternate takes. These are a total treat to watch; I could sit through hours of this stuff. The sequels offer similar clips, but the best ones come with the first flick. We also get fun bits like screen tests; “Dreams” includes auditions for Hamill, Ford, Fisher, Kurt Russell, William Katt, Perry King, Terri Nunn, and Cindy Williams. Note that “Dreams” lets us glimpse some elements from the non-revised versions of the Star Wars. This allows us to see the opening credits without “Episode IV - A New Hope” attached as well as unaltered effects. For the most part, “Dreams” includes a great deal of useful and entertaining information. It moves through Empire and Jedi too quickly, and a little too much fluff shows up at times, especially when it goes into non-Star Wars topics like Lucas-related innovations. 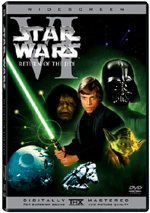 It also indicates that in 1997 with “Special Editions”, Lucas was able to “perfect” the flicks. That statement seems odd since these DVDs reflect even more revisions. Nonetheless, I like “Dreams” a lot and wish it lasted even longer than it does. Also in this area, we find three featurettes. The Characters of Star Wars goes for 18 minutes and 56 seconds as it looks at the series’ personalities. It includes remarks from Lucas, Ford, Hamill, McQuarrie, Mayhew, Daniels, and Lord of the Rings director Peter Jackson, It discusses the early conception of many characters plus various inspirations and changes. The show covers how McQuarrie’s illustrations helped flesh out the roles as well as more specific notes about the films’ main participants and their development. It doesn’t go into great depth but it presents a decent overview of some prominent elements. Next we find The Birth of the Lightsaber, a 15-minute and 33-second look at the series’ signature weapon. We find notes from Lucas, Hamill, and Burtt. The program covers the inspirations for the lightsabers as well as elements of their conception and shooting the battles. We also see how visual and sound effects helped bring them to life plus the pacing of the lightsaber fights. Some great rough footage shows up here, and this stands as a nicely tight and informative project. For the final featurette, The Force Is With Them: The Legacy of Star Wars goes for 13 minutes and 23 seconds. It presents notes from Hamill, editor Richard Chew, writer Lawrence Kasdan, Pixar’s Ed Catmull, and filmmakers Jackson, Spielberg, Roland Emmerich, James Cameron, Ridley Scott, John Lasseter, Dean Devlin, and John Singleton. They offer their personal experiences with Star Wars and the impact it had. They also go into the way that ILM and other Lucas-related enterprises affected movies. This comes across as happy talk at times, but given the film’s impact and significance, it makes sense. It’s also interesting to hear so many prominent personalities talk about the series, as this piece includes some real heavy hitters. In the next area, we find Trailers and TV Spots. For each film, we find three trailers: “teaser”, “launch” and “re-release”. As for the TV spots, four each appear for the first two movies, while we get three TV ads for Jedi. Within “Videogames and Still Galleries”, we locate a mix of those elements. Exclusive Production Photos provides stills from the set. They split into A New Hope (98 shots), The Empire Strikes Back (95 snaps), and Return of the Jedi (95 pictures). These were mostly candid images, but even the promotional shots were fun, and they all provided helpful - and sometimes playful - captions. One nice touch stemmed from the viewer’s ability to zoom in on the photos and eliminate the captions if desired; this helped allow them to maximize the onscreen real estate. It’s a nice collection. More stills appear in One-Sheet Posters, a package of 30 ads for the three movies. These also permit us to get close-ups; you can use your remote to access detail shows of the posters. For the “Videogames” portion of the DVD, we get two pieces connected to Star Wars Battlefront. Fans with the appropriate device can access an XBox Game Demo, while everyone else can watch a 78-second game trailer. In addition, a six-minute and nine-second featurette called Episode III: Making the Game gives us some information. Because I want to avoid as many spoilers for that flick as possible, I didn’t watch it, but I wanted to mention its presence. 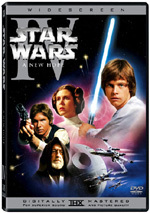 Speaking of the next movie, the DVD ends with an Episode III Preview. Entitled “The Return of Darth Vader”, this piece lasts nine minutes and eight seconds. No, I didn’t check out this program either - call me paranoid, but I really prefer to stay away from Episode III information as much as I can. At least one Easter egg shows up here. Enter “1-1-3-8” in the “title” area and you’ll get a four-minute and 40-second blooper reel. It accompanies various credits and doesn’t present anything terribly special, but the clips are fun to see because hey, it’s Star Wars! Some quick but neat behind the scenes bits emerge here. Many reviews of this package concentrate more on what doesn’t appear than what does. I prefer to evaluate the set based on what actually shows up, but I do want to note one major omission: deleted scenes. Though a smattering of these exists, you’ll find no evidence of them here. Actually, the Star Wars commentary vaguely mentions some, but not a shred of film footage demonstrates their existence. It’s bad enough that the package doesn’t include them in their entirety, but the release should have included some information about them. It’s probably inevitable that another version of the Star Wars “Original Trilogy” will eventually appear; some rumors already point toward a 2007 release. Maybe some fans will want to wait for that potential package, but I wouldn’t. The Star Wars Trilogy presents the movies with uniformly excellent visuals, mostly terrific audio, and a nice complement of supplements. On the surface, the extras may seem somewhat sparse, but with three audio commentaries and almost four hours of video footage, the set comes with a lot of great information, most of which is very high quality. I strongly recommend The Star Wars Trilogy, as it’s a thoroughly terrific package that nicely portrays this classic series.